The Hollandia 400 gives you a real convertible feeling. 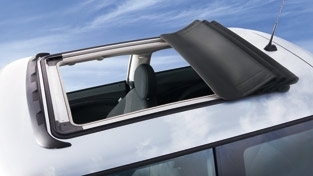 The sporty folding roof is a real eyecatcher and can be opened at random: from a narrow slit to a fully open roof. The Hollandia 400 is individually adapted to the interior trim and is an optical highlight in any saloon. Webasto Hollandia 400 Look forward to some wrinkles to make you younger. The Webasto Hollandia 400 folding roof.